Glorious Leader Attacks "Paid Soros" Protesters - Joe.My.God. No doubt he got this from Fox & Friends. 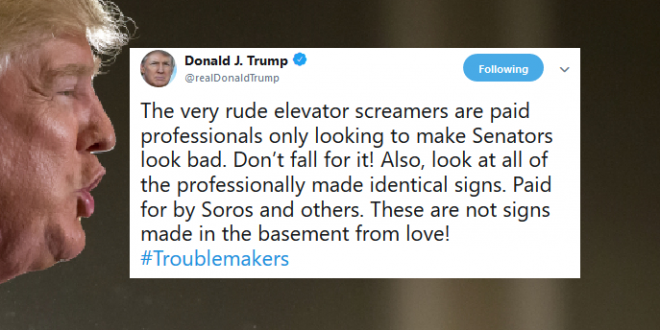 President Trump on Friday attacked protesters demonstrating against Supreme Court nominee Brett Kavanaugh, asserting without evidence that they are “paid professionals.” Trump claimed that billionaire liberal activist George Soros is among those funding the demonstrations against the judge, who has been accused of sexual misconduct by multiple women. He did not provide evidence for his claim.